GetLOD is an open and reusable solution for publishing geographic data on the Web as Linked Open Data, according to the standard RDF / XML. GetLOD has been awarded the first prize of "smeSPIRE Challenge award" during the INSPIRE Conference 2014. GetLOD thus ensures the Web publication of geospatial data as open and linkable data, starting from traditional cartographic webservices. By making available as open data the geographic information published in a Spatial Data Infrastructure, GetLOD ensures the use of data as Linked Open Data, and therefore both their indexing on open data search engine and the integration with open data portals or the Comprehensive Knowledge Archive Network (CKAN), the catalog of the free dataset and projects. 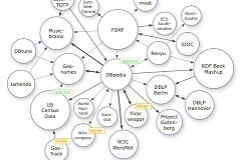 By integrating in standard mode to geoportals, Open Data Portals and Spatial Data Infrastructures based on the interoperability standard defined by the Open Geospatial Consortium (OGC), GetLOD allows geographic data to be publishded in both RDF format (as Linked Open Data) and other not linkable interchange formats (e.g. shapefile and / or GML). In a scenario with an increasing availability of web mapping services accompanied open licenses, GetLOD allows to make the geospatial information available in Linked Open Data format, thus facilitating the aggregation, processing and analysis, with other data. GetLOD arises from the need to maximize the value of geographic data that, accessible in standard formats for the open date, even if published independently by different individuals, can be crossed freely by third parties. Any computer application, through open and standardized format, can then access this data and reuse them in creative ways leveraging, for their own goals, the relationships (links) between heterogeneous information. Open data are the natural evolution of the simple free sharing of databases as the data and their metadata are provided in a standard format and organized into a data structure standard, according to the rules defined at the international level. These characteristics make them directly usable by software applications without any human intervention. This way open data can be used, for example, by smartphone Apps, can be indexed on open data search engines and integrated with open data portals. The difference between exposing on the Web "raw" geographic data (ie in Shape File format or KML) and the Linked Open Data Geographic is that the latter, due to the size and structure standards, can be directly used by computer applications without manual intervention. It is therefore “five stars” data, as classified by Tim Bernes Lee, because in addition to being available on the Web, structured and non-proprietary formats, they comply with open standards defined by W3C and contain links to other data: they essentially are automatically linkable. GetLOD is a solution jointly designed and developed by Planetek Italia and Sinergis during the the evolutive developments of the Geoportal of Emilia Romagna Region. Power point presentation "Geographical Open Data, Semantics and Smart Cities"